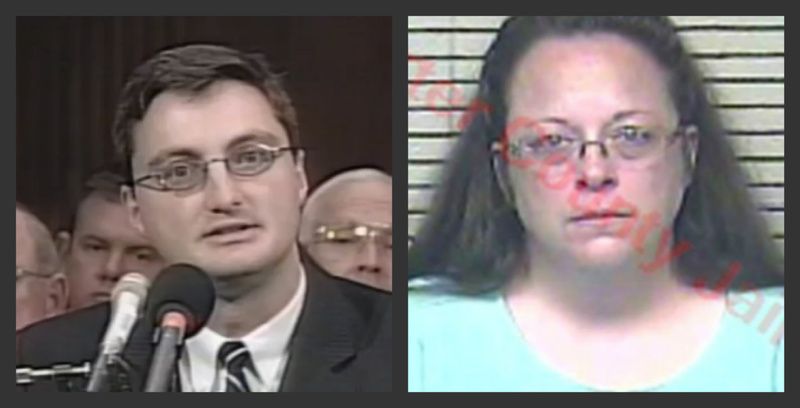 ASHLAND, Ky. — The judge that ordered Kim Davis to be placed behind bars nearly one week ago has now ordered her release, but simultaneously demanded that she not stop any of her deputy clerks from issuing marriage licenses to homosexuals. U.S. District Judge David Bunning’s order came just hours before a rally was set to begin outside of Carter County Detention Center, where Davis had been held for the past six days. He said that he was satisfied with the Rowan County office’s compliance with the Supreme Court opinion in Obergefell v. Hodges, and issued his order shortly after Davis’ attorneys filed an emergency motion to stay the contempt order. He threatened to punish Davis if she defies the order. “If Defendant Davis should interfere in any way with their issuance, that will be considered a violation of this order and appropriate sanctions will be considered,” Bunning wrote. The federal judge, nominated to the bench by then-President George W. Bush, ordered status reports presented to his office every two weeks. “[C]ounsel for the five deputy clerks who indicated that they would comply with the court’s order shall file a status report every fourteen days from the date of entry of this order unless otherwise excused by the court,” Bunning directed. “Within those reports Counsel shall report on their clients’ respective compliance with the court’s August 12, 2015 order enjoining the Rowan County Clerk from enforcing her ‘no marriage licenses’ policy, as well as its order of September 3, 2015 requiring them to issue marriage licenses to all eligible couples in compliance with the court’s prior order,” he mandated. According to reports, Davis’ attorneys have filed an appeal with the Sixth Circuit Court of Appeals and are asking that the state take her name off the licenses. They outline that Davis would be willing to compromise and allow the licenses to be issued as long as her name is not on the document. “If [Davis’ deputies] can issue licenses under someone else’s authority … Kim Davis would not stand in the way of that,” attorney Roger Gannam told CNN on Tuesday. Gannam, an attorney with Liberty Counsel, says that the state could still make it possible for homosexuals to “marry” while providing an opt-out for Davis. However, some opine that there should be no compromise whatsoever and that Davis should interpose in the matter—as should Beshear.